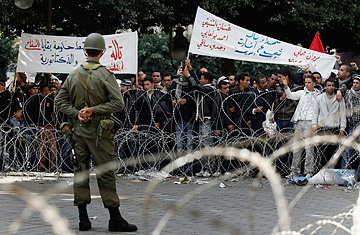 Protesters congregate outside the formerly feared Interior Ministry on Avenue Habib Bourguiba on January 24, 2011 in Tunis, Tunisia. The ouster of their dictator has left Tunisians finally free to speak, and it's as if they can't stop talking. For more than a week, now, clumps of men and women have congregated along the length of the capital city's stylish tree-lined Avenue Habib Bourguiba, just to talk. In clusters of four or five, sometimes more, complete strangers publicly and passionately debate topics that many wouldn't have dared discuss even in private whispers just a few weeks ago. The wide boulevard, lined on both sides by French-style outdoor cafes, has become one large open-air citizens' forum. "The military cannot take any decision in Tunisia," says one man, gesticulating forcefully as he speaks to a small crowd that has gathered around him. "Do you really believe that 160,000 police were held at bay by 27,000 soldiers? Think about it." "Really he's speaking sense," says a young bystander, seemingly talking to himself. The police, both uniformed and plainclothed, were the much-feared muscle propping up ousted president Zine El Abidine Ben Ali's 23-year regime, whereas the small military was widely viewed as a more neutral security force. Its leader, General Rachid Ammar, is an immensely popular figure these days for reportedly refusing orders to fire on civilians, an act of insubordination that may have heralded the death knell for Ben Ali's despotic rule. A few steps further along the avenue there's a small grouping of three of four men. "Do we want somebody like Rachid Ammar," one says, "do we want a military man in power?" "But at least we know he's a nationalist," a man wearing a traditional burgundy chechia hat says. He is leaning against a tree with a handwritten note tied to its trunk: "No to a return to the past, yes to freedom," the A4 sheet of computer paper says. "We don't know any of these exiled opposition leaders," he adds. Popcorn sellers and vendors of traditional cookies called kaak have set up impromptu stalls in the middle of the promenade, along its entire length. Also running the length of the boulevard stand military barricades of coils of razor wire manned by soldiers. Tanks and armored personnel carriers stand at either end. But the atmosphere is festive rather than fearful. A bunch of red and white roses protrudes from the gun barrel of one tank, a gift from a protester. Men, women and children pose for photos near the military hardware. A woman in a pink hijab scolds a young child for getting too close to the razor wire. "Those who want the government to collapse can say so, and those who don't can express their opinions too," says a well-dressed young man in a gray sports jacket as a large crowd huddles around to hear him debate an older man in a green tracksuit. "The Trabelsis used to steal, they are all part of one big gang," responds his opponent, referring to first lady Leila's despised family. "There's a big forum now and everybody can speak," the man in the sports jacket says. "Yes, that's true, it's true," the other man concedes. The discussions, although sometimes heated, are not aggressive. Opposing views are aired and shared. Interruptions are rare, and everyone present is allowed to speak. At the Cafe Tunis, one of many dotting the sidewalk, Mohammed al-Kilani sips on a cup of coffee as he and his half a dozen friends sit on wicker chairs around a small table. "We can breathe now, we are more relaxed politically," Kilani, who is in his 60s says. The men are all Socialists. On the table is a bundle of small pamphlets dated April 2009, containing their party's manifesto. "We used to hand these out in secret," one of Kilani's young associates says, opening his black coat and pointing to its inside pocket. "We'd have to hide this material." And now? He smiles broadly as he waves the pamphlet high above his head. A few steps away, an older woman with a lined face dominated by red-rimmed glasses is holding court. "It's not real change if the same faces remain in government," she says, "but I don't agree with these continuous protests. Demonstrate for an hour or two, do you have to be on the streets from morning until night?" A young teenage boy with the beginnings of a wispy mustache tries to respond but is quickly silenced by the woman. "Why aren't you in school?" she says in a scolding motherly tone. The teenager just smiles sheepishly.